After their recent humbling at Queens in the Irish Cup, Lisburn Distillery were hoping to bounce back against the leagues bottom side Dollingstown however these hopes were soon rocked when the visitors opened the scoring in the 7th minute to take the lead. A through ball had found Richard Thompson on the left wing and he coolly lobbed the ball over the retreating home keeper Jonah Nicholl who initially had came rushing out to clear the danger only to turn back once he realised he wasn’t able to get to the ball first and Thompson duly chipped it over him from outside the box. Things went from bad to worse for the home side as a corner in the 17th minute was delivered in to the box by Andrew McMath and Ryan Lawless was left totally unmarked allowing him the time to head it in off the bar to make it two nil from 10 yards out. Distillery fired back however, as Harris delivered a free kick, from near the left corner flag, towards the 6 yard box, were it was expertly flicked in by Young on the head past the keeper. 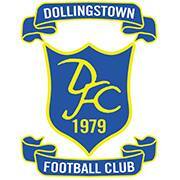 Dollingstown came close to furthering their lead, shortly before the half came to a close, as Ryan Gourley got played through one on one, home keeper Nicholl forced him out the right, with the angle now too tight for the shot and although he played the ball back to the edge of the box, the chance went missing. With the wind at their backs the Whites would have gone in at half time hoping to work their way back into the game however it was Dollingstown who pulled further away, getting another goal as the ball over the top played through to Lawless who had time to pick his cross in to the box, which went towards McMath who got his foot on it to drive home from close distance to make it three one. However, Distillery’s hope were rekindled shortly afterwards when they managed to claw a goal back in the 53rd minute, as McCaw won a penalty in the box, which was converted by James Wright, making it 3-2. Three minutes later the Whites hopes were boosted further when Dollingstown’s Aaron Moffatt was issued with a straight red following a lunge but even with the man advantage the Whites couldn’t break down a resilient Dollingstown and the game eventually petered out for an embarrassing defeat for the hosts. LDFC: Nicholl, Doyle, Moore, Byrne, Curley, Wright, Young, Harris, Beta, Curran, McCaw. Subs; Saunders, Harrison (for McCaw), McCullough (for Beta), Swann (for Byrne), Withers.